Greetings <>- You’ve received this email because you've subscribed to The 50 Plus Fitness-Walker newsletter delivered periodically from 50Plus Fitness Walking. Our goal is to deliver informative, fun and appealing walking features, interesting excecise, news of fun events, contests we are running, other tips and updates on recent additions to our website. All chosen and written specifically just for us 'more seasoned' types who are on the 'golden' side of 50, Enjoy! (SPECIAL NOTE: If you received your advance premier copy by personal email, this is a duplicate copy through normal distribution channels). The Joys Of Walking In A Winter Wonderland! Isn’t it beautiful when you see the glistening white beauty of winter and hear the crunch of crisp snow under your feet? Smell the sweet, fresh air and feel the winter sun on your face? It’s a lot more fun for us to play in the snow, without giving up our daily dose of fresh air! That’s sure enough motivation to get us out there and enjoy our walks all winter long! You can enjoy this incredbly special time of year too. Why not give it a try? Why stay indoors just because it’s winter? Get out and enjoy it! All you need are some good walking shoes & socks, shoe traction gear, layered clothing, good insulated gloves, head cover and sunglasses. Nordic walking poles can be used all winter long too! Just take off the rubber tips and expose the carbon tip to bite into the snow, gravel or ice. Great for your balance too! Remember also to keep yourself hydrated even in the winter. Take along your water bottle. 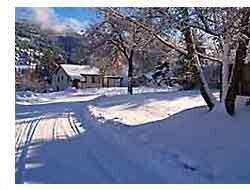 Learn more about how you can enjoy this delightful experience on our new page called Winter Wonderland Walking. You probably have a special story or two to tell. Share your walking or hiking adventures and tales with us. It's real easy and all part of having some 'Fogie Fun'! To get you in the mood, we'll start things off with our latest walking 'adventure'. Here goes! We were out recently for our daily nordic walk on a perfectly normal and fun winter day. We we were just minding our own business in a residential neighborhood when we started to see these funny patterns in the snow. Looked like 5 straight spokes radiating out in a circular pattern about 8" across. Well darned if we didn’t come upon a flock of 16 wild turkeys on our walking route! Those guys are BIG! Their heads came up well above our waists. It was really amusing to watch their determination not to budge or move out of our way. When we made our return leg a little while later, they had moved down the road to another spot, still determined not to move out of our way...they just stared. You can tell they were waiting for one of their flock to make the first move before they all followed their leader. Interesting, exciting and quite out of the ordinary!. But we survived our first 'up close and personal' turkey trot just fine! Can you top that? We’d love to hear your story. In fact you can have your very own web page to do it! And if you happen to have pictures that would be great. Send them along too! Just click here to get started, Tell your friends you've been published on the web! Show them your very own page.After all, at our age, it's all about bragging rights. Right? There’s no need for us to get behind on our basic daily fitness routine this winter. We always do some stretching and warm up exercises before our walks. This year though it's become a whole lot more fun! Now we've added yoga, strength, aerobic and balance exercises to our routine AND we each have our own personal trainer to boot! What's even better? These routines are actually fun little games! We get to see who can do the slalom course better, ski jump farther, hula hoop better, walk the tight rope farther, line dance better - all the time getting the fitness benefit. Another beautiful thing about this experience? It all ‘comes in a box’ and does what it's told and is on call any time of the day or night. We're in charge of our 'trainer' AND having a blast! Yup, we've discovered the Wii Fit Balance Board* system. It gives us motivation to do a bit more each day and have a bunch of fun doing it. No wonder this thing is catching on like gangbusters with seniors too. Laughing and having fun while we get more fit. Now that's cool. One cute little thing it gives you is something called your Wii Fit Age based on your real age, weight, BMI, balance and so on. It’s quite energizing when we find our Wii Age is a whole lot lower than our actual age. Ahh - anti-aging nirvana at last! Truly an amazing and thoroughly enjoyable experience for us both! It's a good addition to our regular stretches, walking and diet practices. Who says us 'seasoned' kids can’t have as much fun as those 'other' kids? Totally FUN! Here's an interview with Shigeru Miyamoto - the inventor of this device here. He's a really neat guy. *(Shopping Hint: click on the smaller link there for better pricing)! Tip of the Month: Keep Going! The stronger and more fit you become, the easier physical challenges become. When you learn to develop good balance and flexibility, you can improve your posture and more completely enjoy your fitness walking. It becomes much more fun when you can participate in all the fun-filled activities you enjoy with friends and family too. Don’t let anything keep you from getting out to participate in your favorite outdoor activity this winter. If you feel you could use a little help doing this, here’s a very good instructional DVD we just added to our Foot Massage page. It features John Schlorholtz, a yoga practitioner with the Harvard University Center of Wellness for over 15 years. It’s called Chair & Standing Routines: Ageless Yoga: Great for Seniors and People Unable To Sit On The Ground. His routines are very helpful for all parts of your body, not just foot massage! Stay tuned for more interesting stuff in our next issue. Keep going with your fitness walking. Spring will be here before you know it! PS - If you’ve gotten a little fuzzy on why walking is so good for you, drop by to our Benefits of Walking page again! PPS - Don't forget to send us your stories! PPPS - We welcome your feedback and ideas for future issues to. Just email us with yours.